A rare site on the East Coast Mainline was this Class 52 Western Hydraulic D1023 “Western Fusilier” heading the northbound Western Talisman rail tour in 1976. 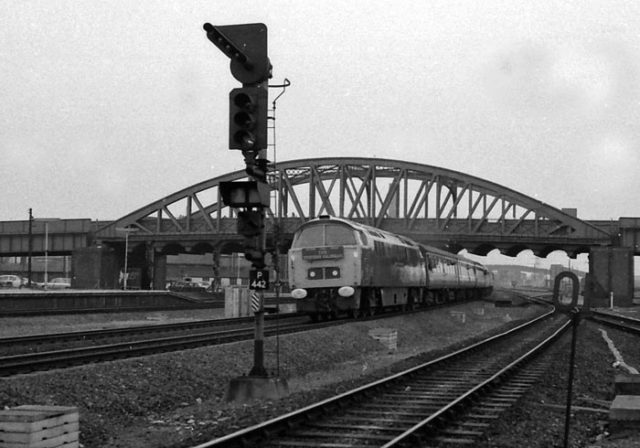 D1023 was in its final year of service before being withdrawn in February 1977 after completing 1,256,000 miles in its 14 year British Rail existence. Thankfully “Fusilier” avoided the cutter’s torch and is now under the charge of the National Railway Museum in York.